The IFB Awards created a platform to acknowledge and honor the outstanding accomplishments of Indian and French companies based out of India, while IN2FRANCE promoted France as an attractive investment destination for Indian companies. The maiden edition of Indo-French Business Awards and IN2France investment event successfully concluded at the Residence of France in New Delhi, in the presence of many eminent personalities, both from India and France. H.E. 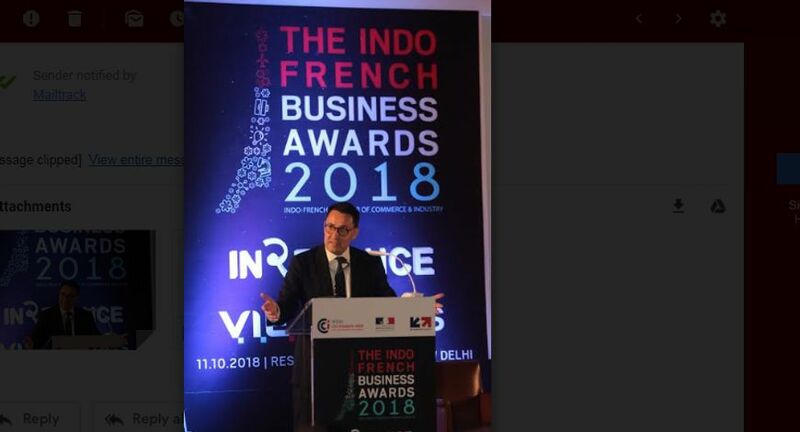 Alexandre Ziegler, Ambassador of France to India hosted the maiden edition of the Indo-French Business (IFB) Awards and the IN2France event. Co-organised by the Indo-French Chamber of Commerce and Industry (IFCCI) and Business France, the French Trade and Investment Commission in India, the occasion brought together top officials and delegates from the Indo-French business community. The IFB Awards created a platform to acknowledge and honor the outstanding accomplishments of Indian and French companies based out of India, while IN2FRANCE promoted France as an attractive investment destination for Indian companies. The evening also saw the felicitation of young and high-performing French professionals through the VIE Awards ceremony. The winners of the award were chosen by the special jury members. Celebrating the best in the business domain, the whole Indo-French fraternity came together to celebrate excellence and to raise a toast to outstanding achievements in the industry so far. Sophie Clavelier, Director of Business France for South Asia, said, “I believe such event as this one today will sparkle interest among Indian investors to choose France as their next destination”.